The whole process of preparing the Comfort-in™ injection system for use in a dental clinic is simple and easy. It should take a few minutes to set up the first time. It will get faster as you become better with each practice. Insert the injector head into Injector holder as shown in the pictures above and the video below. Insert the pressure stick into the hole of the injector’s head (as shown in the picture above). With the help of “push bar,” press the “pressure stick” into the injector’s head. You should hear a “click” sound when the injector’s spring is fully loaded. Loading the anaesthetic drug into the needle-free syringes. Load your standard dental syringe with the anaesthetic drug of your choice as you are used to. Mount the adapter instead of the hypodermic needle. 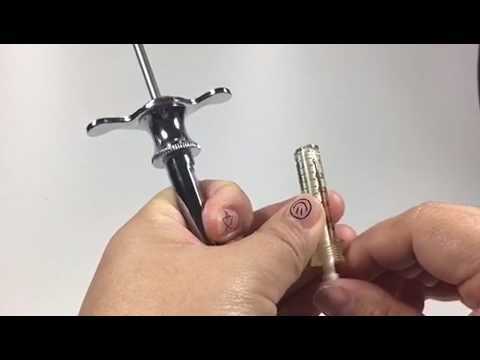 Take a syringe (nozzle) out of the sterile pack and push the plunger inwards to release it, only then pull back and forth to loosen it and finally push it back to its original state. Attach the syringe (nozzle) to the adapter, with one hand hold the adapter and with the other hand turn the syringe (nozzle) clockwise to lock it in. Now slowly inject the anaesthetic drug into the needle-free syringe, fill the desired dose. Repeat the actions listed above to fill up as many syringes (nozzles) as you need. Have 2-3 syringes full with the anaesthetic drug of your choice ready at all times before treatment begins. Have one syringe filled with a small dose of the anaesthetic drug only to the 0.15-to- 0.20ml line. This will be your first injected dose. Now, make sure you match the dose on the syringe to the numbers on the blue part of the injector (see image). The numbers on the blue part represent dose. For example, 20 on the blue part means 20 units (0.2ml). If you use a higher number (pressure) on the injector than on the syringe, it will cause pain and/or discomfort. Always make sure the dosage (number) on the blue part of the injector matches the number on the syringe. After preparing the dose, make sure that the anaesthetic drug does not have any trapped air or bubbles. Attach your filled syringe, inserting it in the head of the injector, screwing it firmly in. Please cover the injector with a disposable sleeve. Do Not Autoclave the injector. Always have the patient in the supine position for maximum access and comfort. Never inject while the patient is sitting upright as it limits the dentist’s view and access to properly inject. The initial injection should be a low dose of the anaesthetic drug, between 0.15ml and 0.20ml, as a sensitivity test. Wait a few minutes and then check the patient for any signs of hypersensitivity. If any are observed stop your dental treatment immediately and create a record of the type of anaesthetic drug as a precaution in the future. Before injecting, make sure to pull the cheek away from the area at the injection site. After pulling the cheek away, the vestibule will be visible. Place the tip of the syringe in contact with the vestibule (see image below, as well as videos). While pulling the cheek away from the injection site, adjust the injector to an angle away from the bone so that the injected local anaesthetic solution will be injected directly into the vestibule. Avoid increasing the injector’s angle because this may cause injury to the bone as the anaesthetic exits the injector at high speed. 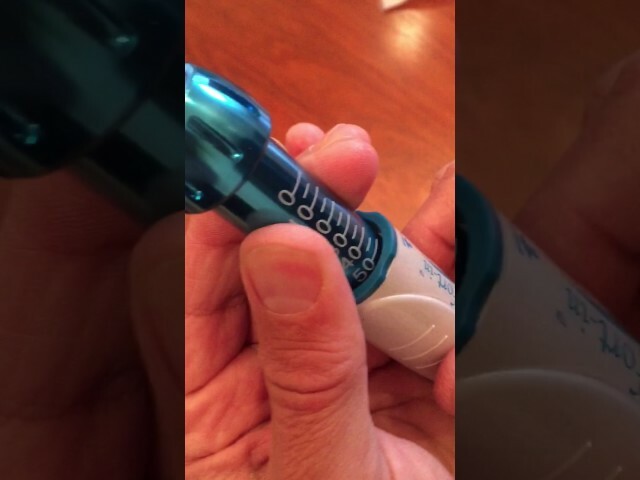 After injecting keep the injector tip pressed against the injection site for a few seconds while using it to massage with gentle and small circular motions. This will distribute the local anaesthetic drug into the injection site and help prevent bleeding. Without needles using the Comfort-in™️- no needles, no bruising, no tissue damage, no pain. Transfer Lignocaine for dental purposes using the Comfort-in™ needle-free dental adapter with a dental syringe by dentist. The dental adapter has been designed to transfer liquid medication such as lignocaine supplied in cylinder cartridges available in dental clinics to the Comfort-in™ needle-free injection syringe. 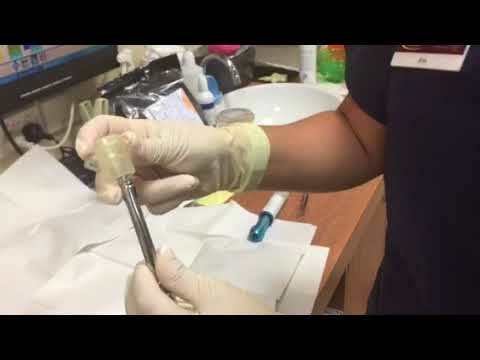 To use it, insert a sealed cartridge containing anesthetic solution into your dental syringe and then screw a new sterile adapter instead of the needle onto the dental syringe. Next, attach the needle-free syringe/nozzle and then slowly and gently push the plunger to fill the syringe/nozzle to the desired dose. 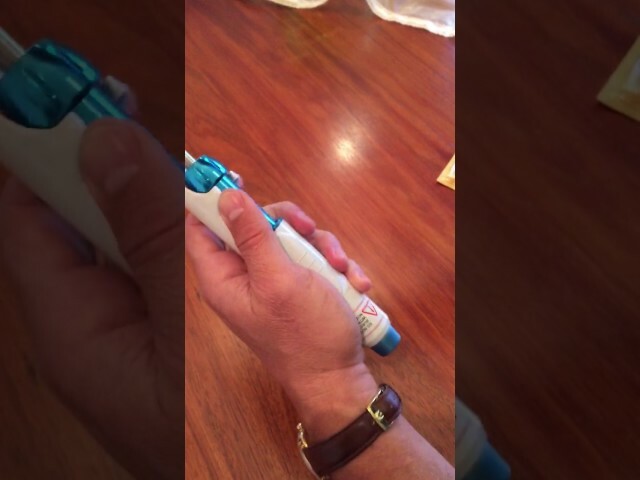 Multiple needle-free syringes can be filled from the same cartridge. Dental adapter for needle free dental injections with the Comfort-in™.Box of twenty (20). Comfort-in™ is currently used by many dentist as an alternative to the conventional syringes and needles. In "Smile place dental"clinic it is used by Dr Arathy Rao and Dr Chitra Rao to deliver local anaesthetics without needles, needle-free and according to Dr Chitra based on her personal experience it's pain free, Dr Chitra Rao was used to the old injex-30 system and definitely prefers the new Comfort-in™ and uses it in all her clinics. If "A picture is worth a thousand words" means that a complex idea can be conveyed with just a single still image or that an image of a subject conveys its meaning or essence more effectively than a description does,so how many words worth a video? Dr Chitra and Dr Arathy from Smile Place Dental are familiar with needle free dental injections for few years since the injex days when Dr Sigal Jacobson perfected needle free injections. Yesterday for the first time they used our new Comfort-in™ needle free applying the "Sigal Jacobson Method of injecting " as Sigal always said Keep It Simple. 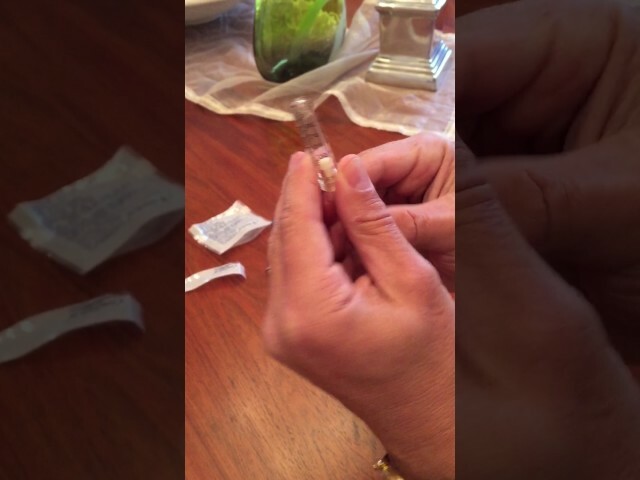 So easy and simple, you use it in same way you use a conventional syringe and needle. The Comfort-in™ needle-free injector inserted into the Comfort-in™ Reset Box to enable charging, can be done single handily. It is an alternative to the Pressure Lever in either clinic environment or for the elderly users or people with "Carpal tunnel syndrome". The dental adapter has been designed to transfer liquid medication such as lignocaine supplied in cylinder cartridges available in dental clinics to the Comfort-In needle-free injection syringe. To use it, insert a sealed cartridge containing anesthetic solution into your dental syringe, and then screw a new sterile adapter instead of the needle onto the dental syringe. Next, attach the needle-free syringe/nozzle, and then slowly and gently push the plunger to fill the syringe/nozzle to the desired dose. Multiple needle-free syringes can be filled from the same cartridge.